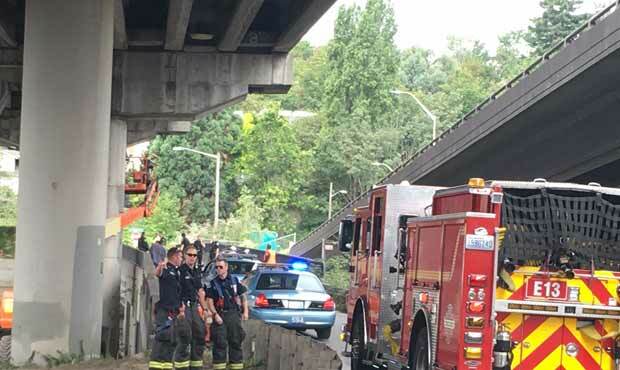 One worker fell off the lower West Seattle Bridge and a second was also injured when their lift vehicle was struck by a box truck. The two workers, both contractors, were in an elevated basket on the lift when a box truck slammed into their vehicle. The first fell 60 feet to the street below. He was taken to the hospital with life-threatening injuries and died at the hospital. The second was saved from falling as far by his harness, but still suffered serious injuries when he fell 15 feet onto the exit ramp. Police and the Occupational Safety Health Administration are investigating the facts of the accident. The driver of the box truck may face charges, depending on the results of the investigation. In a briefing at Harborview, police officers told reporters that the crew had been working on the Fauntleroy Expressway Bearing Pad Replacement Project at the time of the accident. Officials are not yet sure if this accident will delay the completion of work on the bridge. Drivers should avoid onramp to Admiral Way off the West Seattle Bridge, which is closed until further notice. When an accident resulting in serious and life-threatening injury occurs on the job, the initial investigation into any possible contributing factors and at-fault parties is imperative to a victim's chances of a successful personal injury claim. In this particular case, it would appear from news reports that a commercial vehicle may have potentially been responsible for causing the collision that injured these workers. That presents an additional layer of difficulty, as the insurance company involved will likely have investigators and sometimes even a team of lawyers on the scene to collect evidence and interview any witnesses in a relatively short amount of time. Victims of these types of accidents are strongly encouraged to consult with an experienced attorney who has a history of success in handling similar cases. Our office provides a free case analysis and legal consultation to accident victims who wish to learn more about their legal rights and options for recovery.